The cold air around us in winter makes us cold, but that’s only because the body loses heat in more than one way. If you are prepared to combat heat loss, you can stay warm in almost any environment. Any of the five ways can cause the body to lose heat, but if one of them is more prevalent than another, then you can lose heat faster. For example, you should dress differently for a cold day that is 32 degrees F with no wind than for a day that is the same temperature but has 15 MPH winds. The latter situation represents an increase in convection heat loss (hence weather reports that take into account wind chill). Convection and radiation heat loss may be the two most common and also the ones we take the most care to protect against. After all, convection is why we wear insulated apparel, like jackets and base layers, while radiation heat loss is why we take care to cover our head, ears and hands on cold days. For most of us who may be in the cold because of the season but don’t spend hours on end in it, guarding against convection and radiation heat loss is simple. 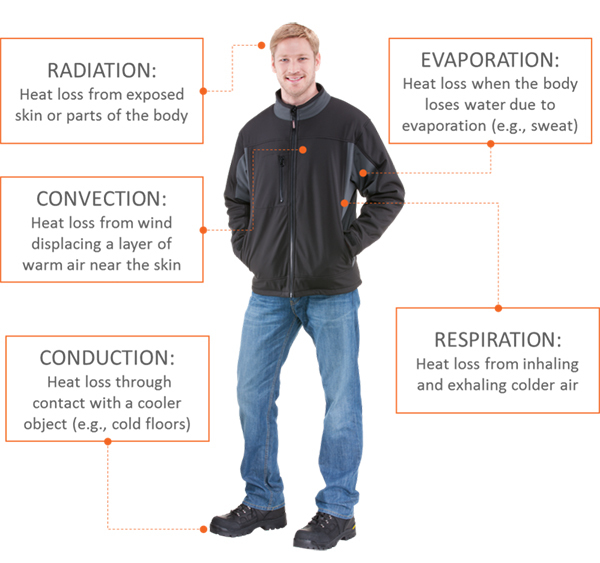 First, choose a jacket that is comfort rated to face the temperatures you will face. If the environment is going to be 30 degrees F and you will not be very active, then choose a jacket that has protection down to 20-30 degree F. The key is to make sure the jacket is able to trap warm air inside and seal out drafts because it is actually the air inside the jacket that keeps you warm. In short, it keeps the cold air from displacing the warm air. Guard against radiation heat by protecting the areas of your body that are normally exposed, such as your hands, head, ears and throat. If your body gets cold, then it will send more blood to vital organs when it is cold and thus putting these extremities at greater risk. In almost every activity we do, our hands and feet come into contact with other surfaces. From the ground and sidewalks to opening doors and holding tools, every surface we are in frequent contact with can transfer cold to our bodies. When choosing gloves, select a pair that will handle the temperature and also provide some wrist protection if it is really cold. Insulated gloves are common with performance or leather gloves, and you can also supplement with a liner in extreme temperatures. While we are all familiar with wearing gloves, not many people think about their footwear properly. For example, an outdoor hiking boot that is good for the summer may not be good for the winter. Even if the boot provides insulation in its upper portion, the sole may be more conductive and let more air or more cold to your feet. Most rubber is more conducive that some composites, and some rubber soles will also crack in the cold. Boots can also feature mid layers above the sole that offer more protection and wicking insoles that help draw perspiration away from your feet. Most people don’t think about staying hydrated when it’s cold, but any loss of water inside your body will quickly add to heat loss. If you’re engaging in a lot of movement and sweating at all, always keep a bottle of water with you to rehydrate. Even if you’re engaging in casual outdoor activities, remember that a dehydrated body is a cold one. If you are outdoors in the winter, then breathing in cold air is almost unavoidable. As long as you’re keeping your core warm, then respiration heat loss can be kept to a minimum. However, if you are in very cold temperatures, choose to wear a mask or balaclava that can cover your nose and mouth. These products can provide some protection from directly breathing in cold air. A neck gaiter may also be used, not only to protect your neck from the cold, but to keep your throat warm. After all, this is where all of your oxygen will pass.